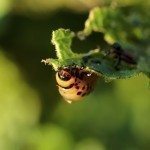 As an organic gardener, you may know the difficulty of finding a good organic insecticide. 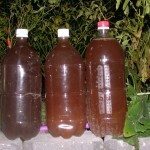 You may ask yourself, “How do I make my own insecticide?” Making white oil to use as an insecticide is easy and inexpensive. Let’s take a look at how to make white oil and why it works as an insecticide. Mix the above ingredients in a jar, shaking well (should turn white color upon mixing). Note: This is your concentrate and needs to be diluted prior to use – using about 1 tablespoon per liter (or 4 cups) of water. You can store the white oil concentrate for about three months in a sealed container or jar. Once diluted, you can use a spray bottle for easy application. Apply to affected plants liberally, especially on the backside of plant leaves as this is where many pests tend to hide or lay eggs. Why Does White Oil Work? White oil works by coating soft body insects, like aphids and mites, in oil. The soap helps the oil stick to the insect while the water loosens the mixture enough to be sprayed on easily. When combined, these two ingredients work to suffocate the insects. Regular applications may be necessary to help protect your plants from pests. Now that you know how to make white oil, you can use this organic insecticide to keep your garden free of pests.